Pick up the phone, Magnus. Sweet Cheeks is calling you. 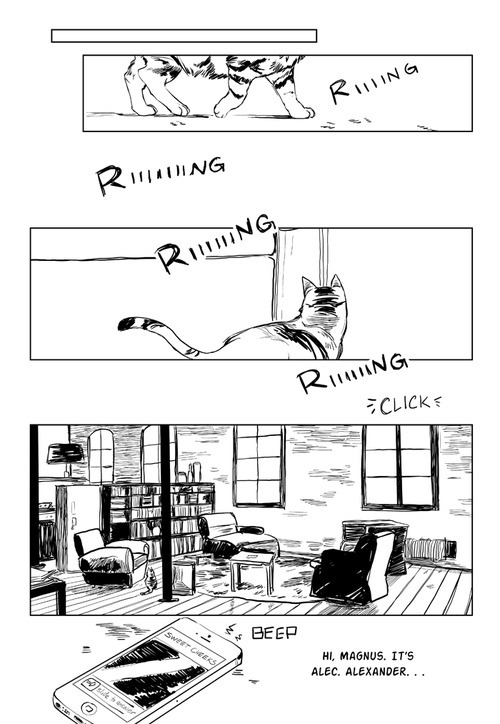 Cassandra Clare shared more City of Heavenly Fire spoilery art from Cassandra Jean, which features Chairman Meow and a very persistent cellphone ringing. City of Heavenly Fire will be released on May 27. I hope the reason Magnus isn’t picking up is because he’s still mad at Alec and not some…other reason. It looks like it might be other reasons since magnus doesn’t seem to be home. Right in the freaking feels. Do you remember that “you broke my phone” snippet? Maybe that’s what happened two minutes before it. It’s just a theory. 3) I like the fact that Magnus isn’t there cos it might mean that he’s in some massive state of depression in a cold, rainy alleyway somewhere; as he should be!! Oooh, good point on that last one. Wow, its an iPhone 5… lol good eye Lauren, I didn’t even pay attention to the phone at first! Oh my gosh the second one is making me cry. EEP! New Spoilery from COHF! I AM DYING TO GET THIS BOOK!